CholeRiceTM + ChoLive is a complex product whose formula contains key nutrients that act synergistically to maintain a healthy cholesterol level naturally and protect blood lipids from oxidation, the main cause of atherosclerotic disease. The nutraceutical complex includes two components: CholeRiceTM, monacolin K in hydroxy-acid form extracted from Japanese red yeast rice, and ChoLive, hydroxytyrosol from olives. The formula includes two other antioxidant nutrients: AstaREAL® astaxanthin and vitamin E.
Red yeast rice has been used for centuries in Japan as an ingredient to season, preserve or color food. It naturally contains monacolin K, a precious nutrient, about which clinical trials have shown that a 10 mg daily intake in hydroxy-acid form helps to maintain a healthy cholesterol level. ChoLive ensures an intake of 30 mg of hydroxytyrosol, a very valuable polyphenol extracted from olives that protects blood lipids from the oxidative stress responsible for atherosclerosis. The antioxidant effect of the products is enhanced by AstaREAL® astaxanthin and vitamin E. The synergistic action of these nutrients contributes to the proper functioning of the cardiovascular system. CholeRiceTM + ChoLive is 100% vegetarian. Lactose-free. Gluten-free. 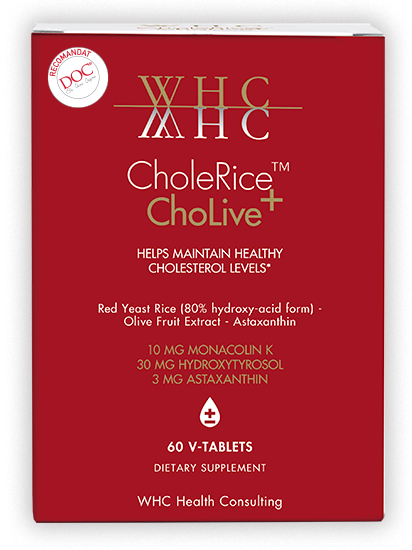 Complex formula CholeRiceTM + ChoLive contains monacolin K in hydroxy-acid form extracted from red yeast rice, hydroxytyrosol, AstaREAL® astaxanthin, and vitamin E, which helps maintain healthy cholesterol levels. Optimal concentrations The CholeRiceTM + ChoLive formula includes the recommended dose of 10 mg of monacolin K in hydroxy-acid form, 30 mg of hydroxytyrosol, 3 mg of AstaREAL® astaxanthin, and 10 mg of vitamin E, 83% of the National Reference Value. Synergistic action Monacolin K helps maintain healthy cholesterol levels, while hydroxytyrosol, AstaREAL® astaxanthin, and vitamin E help protect blood lipids against oxidative stress, the main cause of atherosclerotic disease. CholeRice ™ contains monacolin K in 80% hydroxy-acid form, the most effective concerning LDL cholesterol. Studies show that a daily intake of 10 mg of monacolin K helps maintain a healthy cholesterol level*. * 20 clinical trials on 6663 patients with hyperlipidemia demonstrated that a daily intake between 4.8 and 24 mg of monacolin K may reduce LDL cholesterol by 39 mg/dl. ChoLive - Polyphenols, especially hydroxytyrosol, help protect blood lipids against oxidative stress. The antioxidant action of hydroxytyrosol may help prevent atherosclerosis. Effects are visible with a daily intake of at least 5 mg. ChoLive provides you with 30 mg of hydroxytyrosol in a single dose. Has an antioxidant role in the body. Helps reduce platelet hyper- aggregation, responsible for thrombosis (formation of blood clots in arteries and veins). It also helps to reduce the production of prostaglandins, which are involved in the platelet aggregation process. Astaxanthin is the pink-red pigment found in highly nutritious microalgae species, in salmon, and crustaceans. It is a powerful antioxidant with anti-inflammatory properties, beneficial to the health of the cardiovascular system. Supplementing with this nutrient can help raise HDL cholesterol levels. AstaREAL® Astaxanthin in CholeRiceTM + ChoLive has been processed and developed for optimum cell absorption. The unique technology allows creating perfect conditions for Haematococcus Pluvialis microalga cultures to reach extraordinary maturity levels. Thus, extracted astaxanthin meets the highest standards of quality, stability, and concentration available on the market. Why is the monacolin K in hydroxy-acid form the best choice? Monacolin K, the active substance in red yeast rice, comes in two molecular forms: lactone and hydroxy-acid. Monacolin K in the hydroxy-acid form, also found in CholeRiceTM + ChoLive, is the most effective. The body will use it immediately, as it does not need to be converted and is immediately active. Also, monacolin K in this form supports the optimal use of Q10 coenzyme in the body for cellular energy production. Its benefits in maintaining a healthy LDL cholesterol level are complemented by the action of hydroxytyrosol, AstaREAL® astaxanthin, and vitamin E, which protect blood lipids against oxidation, have an anti-inflammatory role, supporting the health of the cardiovascular system. Ingredients: Red rice yeast (Rice rice / Oryza sativa seeds inoculated with mycelium and spores of Monascus Purpureus providing 10 mg monacolin K); bulking agents: microcrystalline cellulose, tricalcium phosphate, 39:1; olive extract (Olea Europaea) 30 mg of hydroxytyrosol, AstaREAL® (Haematococcus Pluvialis) providing 3 mg of astaxanthin, vitamin E / D-alpha tocopheryl acetate, anti-caking agents: calcium stearate, silicon dioxide, emulsifiers: crosslinked sodium carboxymethyl cellulose, diglycerides of fatty acids; gelling agent: hydroxypropylmethylcellulose. Directions of use: one tablet per day, best taken with evening dinner or according to your health professional's advice. Package contains 60 vegetarian tablets.